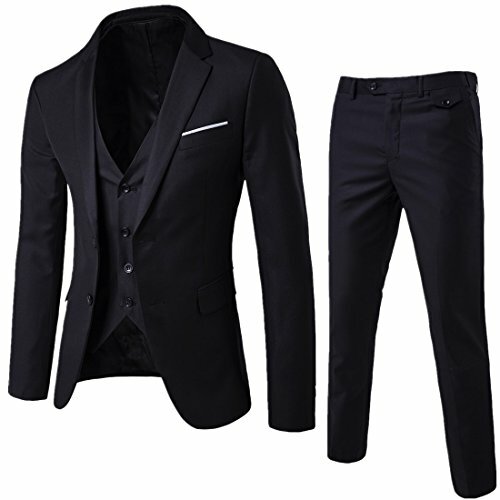 WEEN CHARM Men's Two Button Notch Lapel Slim Fit 3-piece Suit Blazer Jacket Tux Vest & Trousers Set (Small) | What Should I Say? ★For most people ,you just need to buy the size you wear normally. ❤Jacket Features Notched Collar Lapel, Single Breasted,2-Button Closure , 2 Front Flap Pockets on Front of Coat and Two Inner Pockets,Four Sleeve Buttons Each Side. ❤Pants Feature:Flat Front Pants with Expandable Waistband for Adjustment(You can refer to the picture on the left. ),Slanted Side Pockets . ❤Occasion: This Mens 3 Pieces Suits Are Suitable for Party, Meeting,Banquet,Wedding, Ceremony,and Other Formal Occasions. It Will Also Be a Good Gift for His Father, Brother, Boyfriend, Husband or Other Male Friend . ❤Suit Structure : 3-Piece Solid-Colored Suit includes Coat ,Vest and Trousers . We recommend you to wear the suits with oxfords shoes,you can find the shoes by searching B07G1ZT3D1 .❤ We also have separate suit jacket and pants on sale,if you think the blazer,vest OR trousers of the suit set may not fit with you .You can choose separate blazer and pants.Here is the ASIN.➤➤➤Suit Jackets: B07B2Q95BD➤➤➤ Dress Pants:B071GYPRQF.